The 2018 Ford F-150 is here, and it is better than ever in every single way. Yes, we know that’s a bold statement, but the fact is the new F-150 has been improved in every department starting with power. Featuring a brand new lineup of engines that now include a turbodiesel, 3.0-liter Power Stroke option, the new 2018 Ford F-150 features the best towing capacity in its history. That’s saying a lot given that Ford’s pickup, the best-selling vehicle in Canada for more than 50 years, was already quite capable in that department. Ford also made great strides to improve the daily drivability aspect of the new Ford F-150. Indeed, the American automaker added features like an available and class-exclusive Pre-Collision Assist with Pedestrian Detection that can automatically apply the brakes to help prevent a collision with another vehicle or a pedestrian. 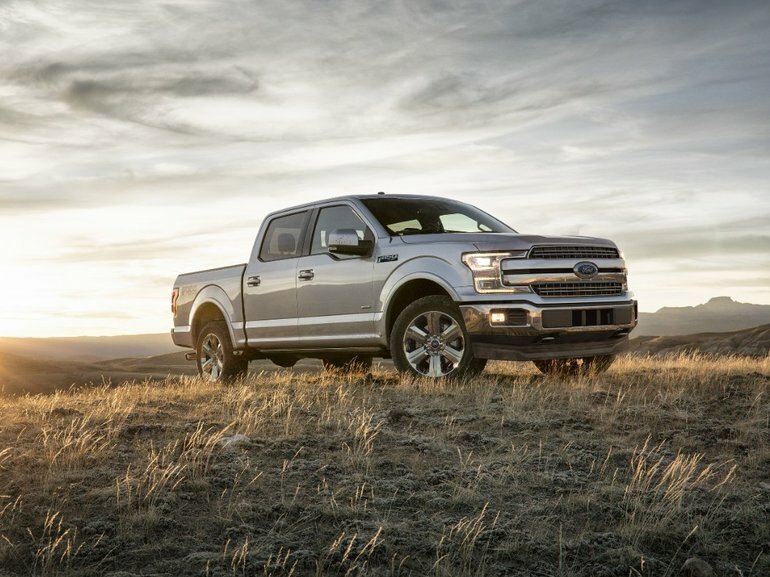 The new engine lineup and the improved safety components are just a few of the reasons why the new Ford F-150 seems to be so popular with the journalists that have the opportunity to drive it. Just aft of the truck’s more horizontal headlight and grille design live the most significant changes. Starting at the bottom of the lineup, Ford has downsized the F-150’s base, naturally aspirated V-6 from 3.5 to 3.3 liters by reducing the bore (the stroke stays the same). The engine now features port and direct fuel injection, a much higher compression ratio of 12.0:1 (up from 10.8:1), and reduced internal friction. Peak horsepower jumps by eight to 290, albeit 250 rpm later at 6500 rpm, just shy of redline, and torque increases 12 lb-ft to 265 and peaks 250 rpm sooner than last year at a still high 4000 rpm. For the first time, the F-150 offers adaptive cruise control that can bring the truck to a complete stop in traffic and accelerate again (provided each stop lasts fewer than three seconds). Forward-collision warning with pedestrian detection and automated emergency braking also join the roster. The engine lineup starts with a 290-hp, 265-lb-ft 3.3-liter V6, which replaces last year’s 3.7-liter. Next up is the 2.7-liter EcoBoost V6 making 325 hp and 400 lb-ft, up 25 lb-ft from last year’s mill. The second most powerful is the 5.0-liter Coyote V8 (395 hp, 400 lb-ft) and the top engine is the 3.5-liter EcoBoost V6, now up to 375 hp and 470 lb-ft of torque. The 3.3, 2.7 and 5.0 all see gas mileage improvements ranging from 1 to 2 mpg. Ford designers, dare we say it, had a little fun with the front and rear redesign. There are six new grilles total, with varying degrees of “c-clamp” headlights and mesh and stretched front bars. The black honeycomb is one of the best, channeling some of the fun Ranger pickup styling from years past. The whole package takes on a more Super Duty look, and that’s fine with us. Trucks don’t want to be luxury vehicles or family wagons, but now they have to be. The 2018 Ford F-150 is proof. Although the F-150 rides on a fully boxed ladder frame with a quartet of muscular engines designed to tow, haul, or drag nearly everything under the sun, the full-size Ford can be outfitted with a menu of luxury features that wouldn’t be out of place on a limousine. To learn more, contact us today at Bruce Ford!